De Guiche and Roxane talk as they walk through the convent. Roxane tells de Guiche that she’s still faithful to Christian, her dead husband, but adds that she “forgives” de Guiche. She mentions that Cyrano comes to see her often. Presumably, Roxane is saying that she forgives de Guiche for sending Christian into battle, indirectly causing his death. Roxane also clearly still doesn’t understand that Cyrano is in love with her. As Roxane and de Guiche talk, Le Bret arrives at the convent. Le Bret greets Roxane and tells her that Cyrano has become highly unpopular in the city. His witty insults have made him endless enemies, even though his skill with the sword allows him to defend himself at all times. De Guiche says—half to himself, half to Roxane and Le Bret—that he envies Cyrano. He says that when one is successful, like de Guiche himself, one’s life is full of a vague unrest, and Cyrano need never experience this unrest. In another ambiguous moment, de Guiche praises Cyrano for his rugged individualism. Cyrano may live in uncertainty, but uncertainty is thrilling and exhilarating—de Guiche, by contrast, lives a happy, prosperous life, but this life is dull and unexciting. These lines could be interpreted as de Guiche being sarcastic and patting himself on the back, or he could be sincere in his admiration for Cyrano (an admiration that we’ve already seen in Acts 2 and 3). De Guiche pulls aside Le Bret and tells him a secret: there are those who plot to kill Cyrano. Since Cyrano is coming to the convent today, Le Bret says that he’ll warn Cyrano. We genuinely can’t be sure if de Guiche is threatening Cyrano’s life, or if he’s warning Le Bret and actually trying to save Cyrano—or both (he may have arranged Cyrano’s death, but now regrets it and tries to save him). There’s no conclusive evidence either way, and it’s up to the director and the actor playing de Guiche to decide. The nuns then tell Roxane that Ragueneau has come to the convent. Roxane tells de Guiche and Le Bret that Cyrano has fallen on hard times—he’s worked a number of odd jobs in recent years, even making wigs and teaching flute lessons to make ends meet. 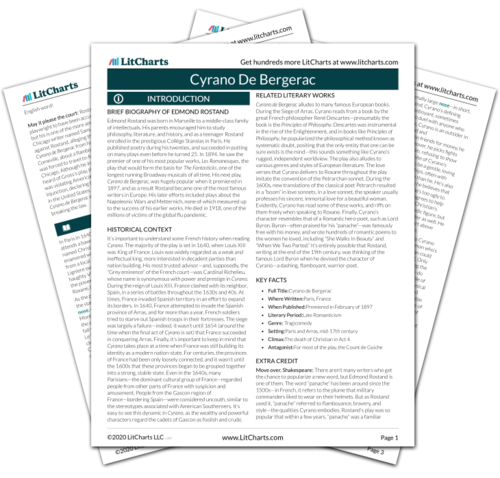 It comes as a shock to learn that Cyrano has fallen on hard times—from the nuns’ descriptions, we’d assumed that Cyrano was exactly the same. In part, Cyrano’s declining fortunes are the result of his misery after Christian’s death, as he lost hope of ever being able to tell Roxane the truth. But Cyrano’s declining fortunes were also rather inevitable: he’s always lived extravagantly, giving away whole purses of gold at a time, and “feeding” himself only on poetry. Sooner or later, this lifestyle was bound to catch up with him. Arn, Jackson. "Cyrano De Bergerac Act 5, Scene 2." LitCharts. LitCharts LLC, 21 Mar 2016. Web. 23 Apr 2019. Arn, Jackson. "Cyrano De Bergerac Act 5, Scene 2." LitCharts LLC, March 21, 2016. 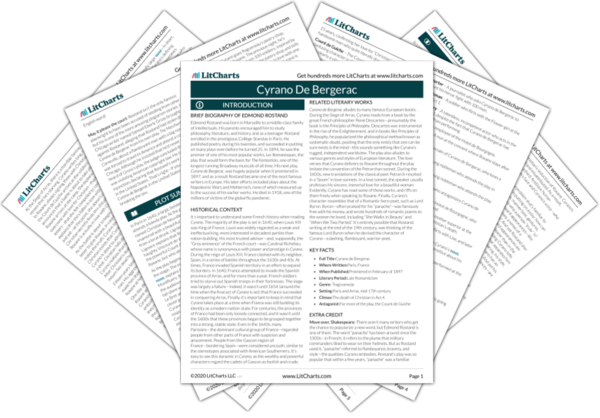 Retrieved April 23, 2019. https://www.litcharts.com/lit/cyrano-de-bergerac/act-5-scene-2.